hertz has been developed in collaboration with Dr Graeme Marlton at the Meteorology Dept. Reading University, Professor Bill Chaplin at the Astrophysics Dept. Birmingham University and mathematician Andrew Gibbs. Producer is Kate Stoddart. Lead artist Juliet Robson: hertz is a project supported by Unlimited, celebrating the work of disabled artists, with funding from Arts Council of England. 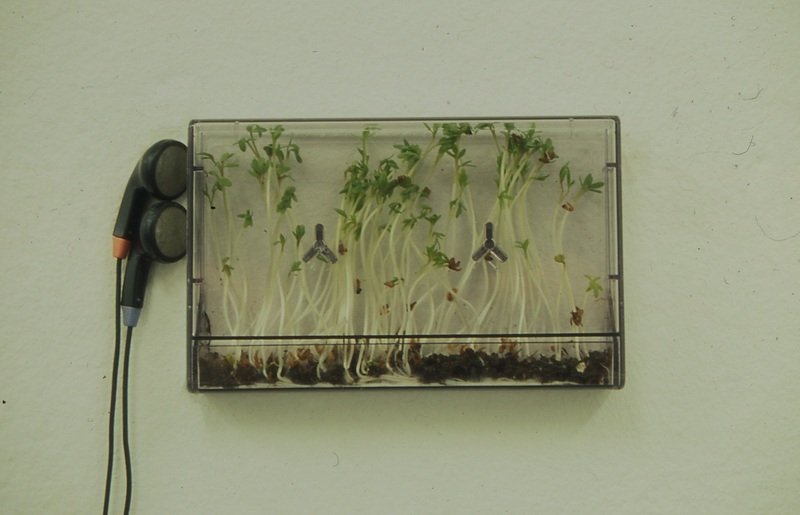 Cress and Sound: Original concept chosen for the Ida Branson Memorial Exhibition and catalogue 2004. Large scale work developed for a new commission from Nottingham Castle Museum and Art galleries summer show Pleasure Garden 2004. In the exhibition 36 individual pieces of music chosen by museum staff were played through ear phones to cress growing in tape cassette boxes on a large pink wall. Visitors listened to the music and saw how it affected the cress’s growth. Cress and Sound referenced Dorothy Retallic’s controversial scientific research into the effect of music and sound on plant growth. Architectural tuning: Reading University campus 2002: The rooms of a rundown terrapin were strung with a full complement of piano strings from a grand piano ranging from thick copper wrapped bass wires to fine top note wires. Using piano makers’ pegs and tuning hammers, the strings were tuned to the architecture and the structural limit of the walls. The strings would vibrate and hit each other as the floor boards were walked, run or jumped on setting off notes and harmonics. People would literally ‘play’ the architecture. Synapse: Time-based work made for Bonnington Gallery, Nottingham 1994: An open copper box sat in the middle of the floor in the gallery. Copper sulphate solution in nine boxes sitting on a shelf evaporated over time by methylated spirit in the bottom tray. People were invited to stay and contemplate the flames that changed colour as the copper sulphate solution burned off. A soundtrack of harmonics made in the gallery played from the duration of the time the mentholated spirit burned out and the flames died. Wire and Light: Made for SHOW, The Art Pavilion, Ecology Gardens, London 2005: An old projector with dust and hairs in the gate, a wide gauge piano wire for low tones fixed to the floor and the ceiling. In this site specific installation people would enter the room and hit a button that would turn the projector on for five minutes. The wire would then be lit up casting its shadow onto the frame. As someone reached to pluck the wire they would also cast a shadow of themselves. The length of wire and its fairly loose tension created a very low tone that reverberated through the light fittings and the oscillations of the wire and its shadow continued long after the sound had dissipated. Cycles: Open studio work, Nottingham 1994: Circular mounds of grass seed on earth, bread rolls watered with milk and cress seeds on newspaper coils were encouraged over a number of weeks to follow their natural cycles of growth and decay. Copper conducting wire threaded through each mound representing the energy involved the natural process. The Prediction Machine: Click the link forThe Prediction Machine 2015, an interactive installation that predicts the future impacted by climate change, exhibited at Nottingham Contemporary and at FACT, Liverpool. A conversation between trees: Click the link for A Conversation Between Trees 2011-12, an international collaboration that uses environmental sensors to connect forests in the UK and Brazil through a series of exhibitions and public interventions in forests. Images from early research by Juliet Robson for hertz: Salt grain Chladni patterns made from vibrations of frequencies (hertz) occurring in nature. Different frequencies vibrate the Chladni plates in their own specific way and result in various oscillating patterns. Experiments done at Wyfold Lane Studio, 2017. Please go to blog for more info, about hertz: ‘If you want to find the secrets of the universe think in terms of energy, frequency and vibration’ – Nikola Tesla.